Sending email with Evolution is again very straightforward. There are two server types available: SMTP and Sendmail. SMTP stands for the Simple Mail Transfer Protocol and is the standard way of sending mail over the Internet. This option refers to SMTP servers that do not run on your computer itself. Sendmail is jargon coined from the program by the same name. It refers to any program that runs as a server on your computer for the purpose of sending mail over the Internet using SMTP. These are sometimes called MTAs (Mail Transfer Agents) because their express purpose is to transfer mail via SMTP. By default, Evolution assumes you are sending email through a remote server via SMTP. If, however, you simply want to receive mail from remote servers but send mail locally, choose "Sendmail". The configuration options will then disappear because Evolution assumes you are configuring the sendmail-like program yourself. If you choose "SMTP", you can then select the type of encryption to use when relaying mail to the SMTP server. You can also select different types of authentication. As with retrieving email via POP, Evolution will check for supported types of authentication when you click "Check for Supported Types". When using encryption, however, Evolution will require you to enter the username you use for the SMTP server. This may sound odd considering you probably enterred the same username for the POP server. But Evolution does not assume that you are sending your email through the same service as the POP server. Put another way, you can receive mail from "my_first_email" at "pop.example.com" but send mail using a different account, say "my_other_email" at "smtp.second-server.com". Next, give the email account a name. 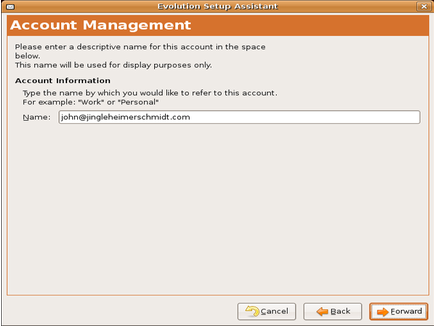 By default, Evolution uses the email address associated with the account. However, this handle is the name by which you want to track it, not Evolution. It will be the name among the accounts listed in the lefthand bar of the window. Evolution recognises that you may be around the world from where the mail is actually being sent. You may not want to use local time to keep track of when email comes through. Therefore, you are asked to choose the timezone you would like to use for this account. 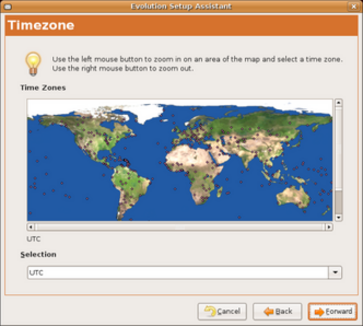 As you did with the installation process, simply zoom in and select the nearest location. Alternatively, you can select a location from the drop-down list. Click "Forward" to complete the setup of your email account. You should then see a congratulatory message. Click "Apply" to save the settings you just enterred. Now that your email account is setup, you will see a window like the one above. To retrieve your mail, simply click on "Send/Receive" in the toolbar. You will then see your email start to tally in the Inbox.